Phelan fell into step with me a few moments after I started walking. I didn’t look at him and he didn’t spek until we’d wandered through the gap between the ruins of Mackinac and the tent were we were still keeping livestock and building supplies. I shoved my hands into the pocket of my sweatshirt, feeling my skin prickle slightly as we passed through the ward lines to the unprotected area beyond. He shivered beside me and smiled faintly, glancing me sidelong as I led him toward the bridge. “They’re strong wards,” he said simply. I nodded. “Yeah,” I said quietly, eyes on the trees, on the rim of the ravines. “I hope that they’ll actually do the job.” I looked toward where the bridge generations of students here had dubbed ‘Little Mac’ and was surprised that it looked intact, even steady. No new cracks in the concrete of the walkway, the metal rails along either side looked intact. “One of the places,” I said softly. I closed my eyes for a moment and could feel the power he was talking about, the power that had always been there, just at the edges of our perception. Were our theories right, the ones that we’d only whispered on those late-night walks? That we’d been drawn here, felt that we belonged here because of the lines of power—the leylines—that encircled most of campus, that ran its length and breadth from the ravines to the river, that gave rise to enchanted places like the Shakespeare garden, now in ruins? I took his hand and led him onward, onto the bridge. It wavered slightly under our steps and in the wind, but no more than usual. Panic that began to rise inside of me subsided as I reminded myself that it always swayed a little under my footsteps and had become so commonplace that I’d just learned to ignore it. Phelan tensed and relaxed almost in time with me, exhaling softly as he followed me out to the center of the bridge, which hung seventy feet above the ravine floor—and the line that lay buried in the creek, among the stones and rocks and trickling water that had become more like a flood in the past weeks. I leaned against the rail and stared down, motioning for Phelan to join me. 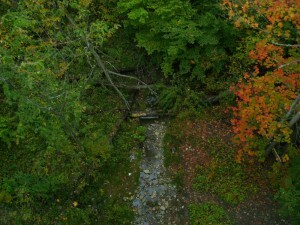 He peered over the edge of the rail down at the creek and shook his head slightly. He considered that for a moment, then finally nodded. “A bit worse than that, I think. You make them sound positively stable. I was outside of Chicago when it happened. There’s nexus points in the city, and they moved and were just ripping things apart. I was lucky that I wasn’t there.” He rubbed at the bridge of his nose, voice dropping to a whisper. “I’d never seen so much death as what I saw three weeks ago.” His voice was haunted, gaze a hundred thousand miles—or perhaps a thousand years—away. “I’ve seen a lot of it in my time. Death. War. Some of it truly awful. But this was worse than anything I’d ever seen. It really was as if the world itself was trying to break. I’m still not sure what webwork held it together.” His voice was almost mournful. “When we came back here from Tírinna‘Óc, we came hoping that we could stop this, the things that have happened. When the ways between began to weaken but the bridges were shorter, we knew that something was going to come to pass.” He winced visibly and shook his head. My mouth was dry, heartbeat starting to quicken slightly. “Did I what?” He knows about your visions, Marin, I reminded myself. Either Kira told him, or he’s able to sense that about you, just like he’s able to feel the wards and feel the lines and the power here. After staring at me a moment longer, Phelan nodded slightly. “Then he was right to send me and I was right to come. I’m just sorry I wasn’t here sooner.” Phelan looked away from me again, toward the creek below. “It’s going to get harder before it gets easier,” he said, a note a sadness in his voice. The photograph included in this entry is an actual shot from the bridge and ravine that inspired the setting for Awakenings. 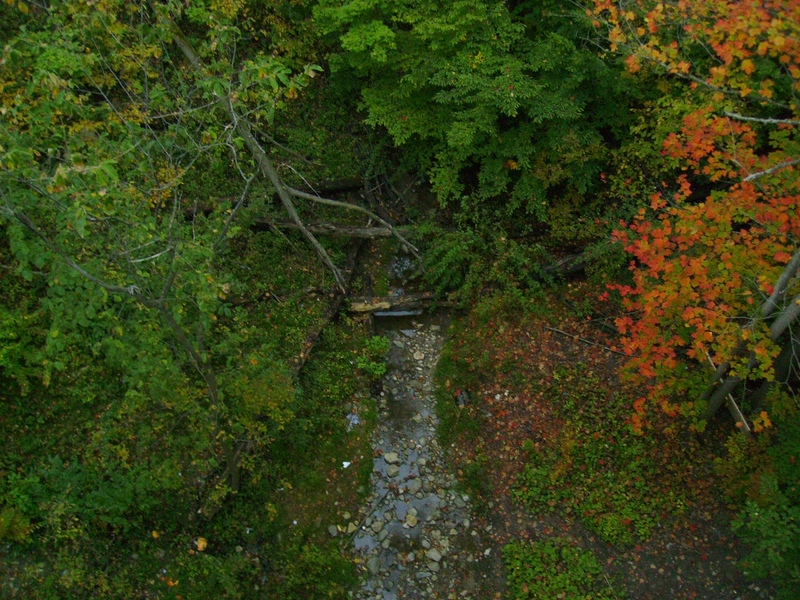 The photographs included in the next few entries are also of the same ravine, though different areas of it. Happy Monday folks! I had a very productive Sunday, in that all of this week’s entries are already written and loaded in. I apologize, but it’s a lot of Marin and Phelan…and apparently, when those two get together, things get a little strange (discussion wise, I mean!). I look forward to thoughts and comments from readers on the content of their conversation, because we’re starting to get into the meat of the mythology (and reality) of this new world our survivors have found themselves in. Until Wednesday, try to survive the holiday shopping season! Happy Monday.